Over 20 artists will play Ireland’s longest running annual beer and music festival at Hilden Brewery, Lisburn over the bank holiday weekend from August 24 to 26. Now celebrating its 36th year and located at Irelands oldest independent brewery, the festival showcases the finest collection of music, complemented by the wide range of local beers, ciders and spirits available across the weekend. The 2018 event is set to be bigger than ever with more acts, more stages and a host of family friendly activities for children of all ages to enjoy. Alderman William Leathem, Chairman of the Council’s Development Committee, said: “I was delighted along with the Mayor, Councillor Uel Mackin to be part of the launch of this upcoming festival. 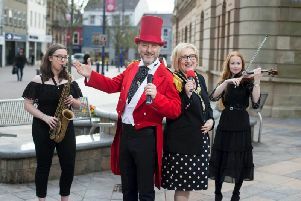 Lisburn & Castlereagh City Council is pleased to support such a well-organised event which has a packed programme of bands and solo artists and makes our city a more colourful and vibrant place. This local attraction will also be showcasing its gourmet food and speciality beers.